Featured: An artist’s rendition of the city-owned Bert Ogden Arena, a first-class indoor multi-purpose center being built at the corner of Interstate Highway 69-Central and Alberta Road in east Edinburg, which according to building permits issued by the City of Edinburg, is valued at an estimated $88.3 million. On Tuesday, February 6, 2018, representatives for The Vipers Arena, LLC will present an update on the project before the Edinburg City Council at Edinburg City Hall. The city council session begins at 6 p.m. Representatives for The Vipers Arena LLC, which is overseeing all aspects of construction of the $88.3 million, city-owned Bert Ogden Arena, on Tuesday, February 6, 2018, are scheduled to make a major presentation on the progress of the complex before the Edinburg City Council, the Edinburg Economic Development Corporation has announced. Vipers Arena LLC of McAllen, whose principal agent is Alonzo Cantú of McAllen, is serving as the private investor in the Public-Private Partnership. Vipers Arena LLC is overseeing all aspects of the construction of the facility, with Cantú Construction of McAllen, which is a company owned by Alonzo Cantú, building the Bert Ogden Arena. Vipers Arena LLC will also serve as the major tenant of the Bert Ogden Arena, and will be responsible for the operations, maintenance, scheduling of events, and marketing of the facility, which will feature 8,500 fixed seats, which includes 1,200 club seats, 12 luxury suites, a restaurant/club area, locker rooms, offices for sports team personnel, and marquee signs by the expressway. The Edinburg EDC is the jobs-creation arm of the Edinburg Mayor and Edinburg City Council. The Edinburg EDC Board of Directors is comprised of City Councilmember Gilbert Enríquez as President, Edinburg School Board Trustee Miguel “Mike” Farías as Vice-President, Isael Posadas, P.E., as Secretary/Treasurer, and Julio César Carranza and Noé Sauceda, Ph.D. as Members. Representatives for The Vipers Arena LLC, which is overseeing all aspects of construction of the $88.3 million, city-owned Bert Ogden Arena, onTuesday, February 6, 2018, are scheduled to make a major presentation on the progress of the complex before the Edinburg City Council, the Edinburg Economic Development Corporation has announced. The city council, which meets at Edinburg City Hall, located at 415 W. University Drive, will begin its public session at 6 p.m.
Vipers Arena LLC will also serve as the major tenant of the Bert Ogden Arena, and will be responsible for the operations, maintenance, scheduling of events, and marketing of the facility, which will feature 8,500 fixed seats, which includes 1,200 club seats, 12 luxury suites, a restaurant/club area, locker rooms, offices for sports team personnel, and marquee signs by the expressway. City Manager Richard Hinojosa, in his executive summary on the agenda item, provided some background on the complex, which will be the largest indoor facility of its type south of San Antonio. 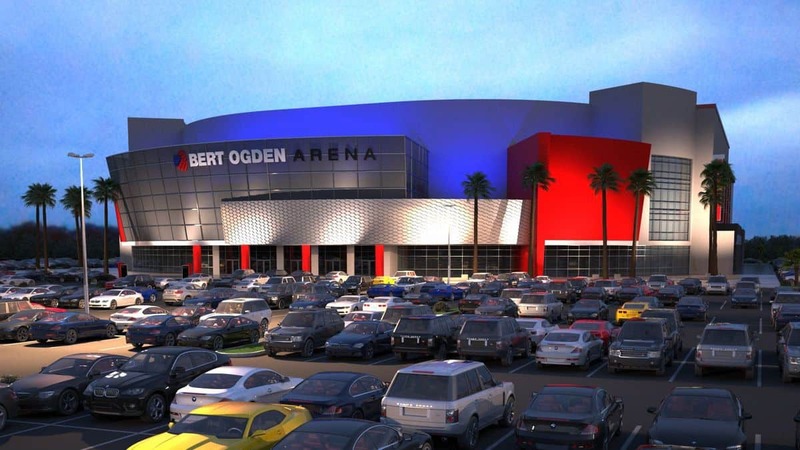 “The City of Edinburg Local Government Finance Corporation (LGFC) entered into an agreement with the Vipers Arena LLC to undertake and construct The Bert Odgen Arena, a multi-purpose event center which will provide for sporting events, concerts, family shows, trade shows and similar events,” Hinojosa stated. On Monday, November 20, 2017, the Edinburg EDC Board of Directors, whose members had recently been appointed to their public service positions, received some background on the arena. One of the more valuable public construction projects in Edinburg’s history took a major step forward in January 2017 with the issuance of a building permit, valued at $80 million, for the city-owned, 190,000 square foot Bert Ogden Arena. Once completed, the total investment for the Bert Ogden Arena, a first-class indoor multi-purpose center being built at the corner of Interstate Highway 69-Central and Alberta Road in east Edinburg, will reach an estimated $88.3 million. In addition, the Bert Ogden Arena will serve as the home for Rio Grande Valley Vipers professional basketball to Edinburg. Currently, the RGV Vipers play their home games at the State Farm Arena in Hidalgo. The RGV Vipers are affiliated with the NBA’s Houston Rockets.